Using the API just got a lot easier with the Query Explorer. We hope you enjoy it! You may have heard about the Google Analytics Data Export API and be wondering, "What do I do with it?" Well, you may already know that you can pull most of your Analytics profile data using the Google Analytics Data Export API just by creating the right query. And then from there, the sky is the limit. Isolate, integrate, and share the data that you want to see in a huge variety of ways. Still, it's this first step that can be overwhelming. How to build a query from scratch, especially when you're used to the point-and-click experience of the your Google Analytics account's reports? To help you out, we built a visual aid to make query construction a snap: the Data Feed Query Explorer. 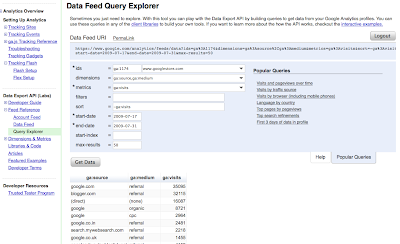 Query Explorer tool found in Google Analytics developer docs feed reference. The Query Explorer is the perfect place to start exploring the Data Export API. You can use the tool to quickly get data from your Analytics account before you even start to write your first line of code. Log into the tool, select a profile, and get a display of data in seconds. From there, you can figure out just what data you want, while at the same time learning how to use the API. We've included interactive help and links to our documentation so you can learn how all the query parameters work together. This beta version of the Query Explorer is a developer tool that we wanted to release as soon as possible to help you explore the Data Export API and troubleshoot your app.